Switching to a career in fine art from his dream of becoming a commercial artist, Ed Ruscha first came into prominence in the early 60s with his large word paintings and paintings of commercial icons, such as Twentieth Century Fox and Standard Station, that related in manner and style to the nascent Pop art movement. Drawing on a variety of sources that also included his own drawings, prints and artist's books, Ruscha was often associated with the west coast cool style, but ultimately his work confounded the art world with its sly and elusive sense of deadpan humor, as seen in his series of bird paintings and in the liquid word paintings that rounded out the decade. 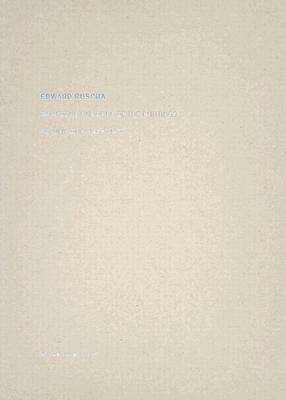 The Edward Ruscha Catalogue Raisonn of Paintings is a five-volume series under the general editorship of the Gagosian Gallery, and is a co-publication between Gagosian Gallery and Steidl Verlag. Volume One contains 137 paintings printed in full color from Ruscha's student period to the Pop- and Conceptual-inflected word paintings of the 60s. The catalogue includes a comprehensive exhibition history, bibliography and biographical chronology, as well as an appreciation by former Menil Collection director Walter Hopps and an essay exploring Ruscha's pioneering use of language as a subject matter by art historian Yve-Alain Bois of Harvard University. Set in Franklin Book type and printed on acid-free, 170-gram Job Parilux paper, each volume of the catalogue has a stitched binding and a cloth cover with silver-colored embossing protected by an embossed slipcase. Specifications for subsequent volumes are the same. All reproductions were converted to digital form, thanks to which process it has been possible to restore the reproductions of long-lost paintings.